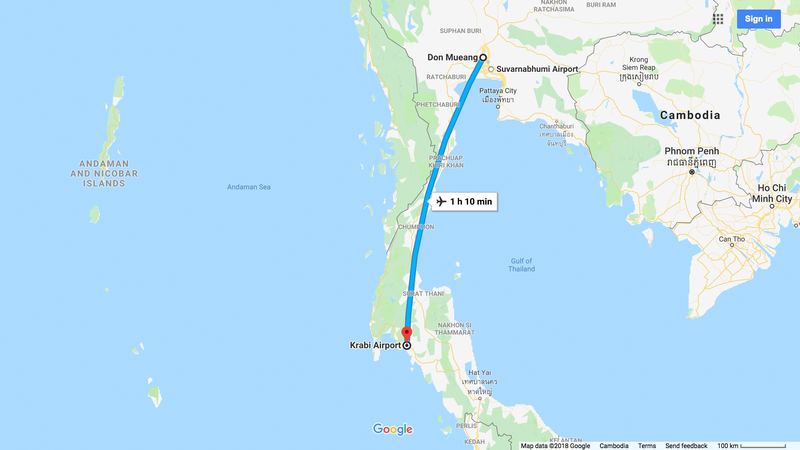 We booked an one hour flight from Bangkok Don Mueang Airport. Bangkok has two airports. I’ve actually no idea if they distinguish in any way as they both seem to offer domestic and international flights. When I’m looking for the cheapest possible flight, I use Google Flights. You just type in “Bangkok” as city of departure and google automatically searches for flights from both airports. It doesn’t really matter which one you take. The flight was only 30 bucks! Thanks to airlines like AirAsia or NokAir flying is a faster and sometimes even cheaper way to travel in Asia. Our airbnb was at AoNang beach. We didn’t know anything about that region! Life is an adventure, so we just booked something that looks good somewhere close to the sea. And living right at a beach sounded great for us! Arriving at the airport – which was btw really small and nearly empty as soon as the passengers of our flight had left – we looked for ways to get to AoNang. We could have walk outside and look for a taxi or a tuk tuk but who wants to carry their luggage longer than needed? Right inside the airport we walked up to one of the bus companies that offers rides in taxis, minivans or busses to pretty much everywhere. We payed – attention – 150 THB (≈ 4.60 US$) for a 40 minutes ride. One thing we noticed about asian passenger transport services is that most of the time you get a free pick-up from your location (e.g. hotel lobby) and also they bring you everywhere you want to. In Germany there’s a bus station you have to go to on your own and a bus station they let you out somewhere in the destination area. Here in Asia busses work a bit more like private taxis. There were around 10 to 12 people in the minivan we took from the airport. Everyone wants to go to AoNang Beach but everyone wants to go to another hotel. Nevermind, the staff asked every passenger for the name of their stay and the driver stopped at every single one of them! Now that’s customer service! I gotta say, AoNang Beach is cute! You can walk the beach promenade up and down, sit in good restaurants with a nice view and shop in beach boutiques and souvenir shops. Palm trees line the street and there’s a night market only 400m from the promenade away where you can grab some local street food and maybe see a little girl showing off her dance moves on a small stage (It’s in my story highlight for AoNang: @martinklengel). For us backpackers who try to live as cheap as possible (because we have to go back home as soon as we got no money left) the general pricing of the shops at AoNang was a downside. The sellers know that they’re in a very touristy area… and tourists have money! Because of that they don’t really care if you try to negotiate. They may give you a discount of 2 or 3 dollar but nevertheless the prices are way higher than in non-touristy areas! If you are used to the prices of the Tawanna market in Bankok or read too much about ultra low prices in Thailand before your vacation, you may be disappointed. But in comparison with western pricing of course you’ll still have a pretty cheap vacation here as well as in other parts of Thailand or Asia. 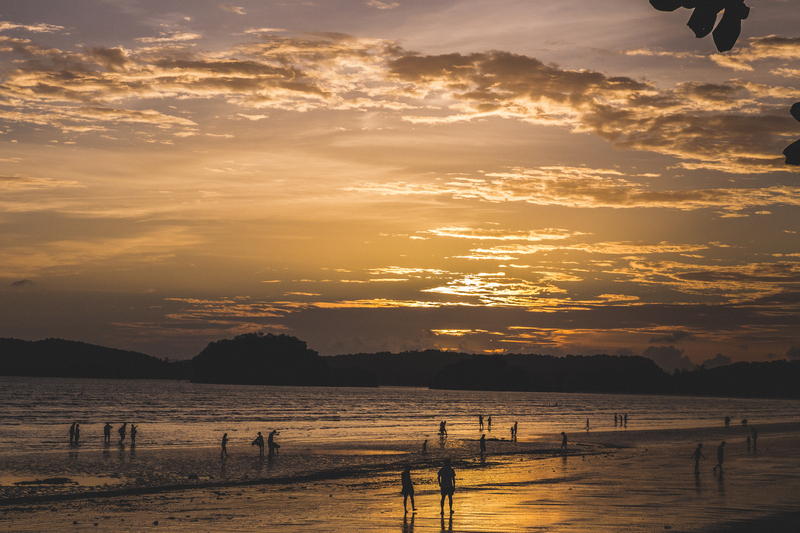 When you’re at AoNang Beach you will see advertisements for half-day or full-day boat trips, maybe you even can book those over your accommodation. We did a half-day 4 Island Longboat Tour. Starting at around 1 or 2 pm, you’ll be able to see 4 small and beautiful islands that are located not far from the main land. Every boat ride (from one island to another) takes around 15 to 20 minutes and the tour will instruct you how long the boat will stay at every single one of them so you can move freely on the island and just have to be back in time… otherwise the boat will leave without you! So better carry a watch with you. You can choose between longboat (those typical wooden boats you see on 90% of the pictures when you google Thailand) or speedboats which are more expensive of course. But regardless of the price I’d choose the longboat anyway. It way more authentic and I’d rather enjoy a 20 minute boat ride than a 5 minute boat ride. We however do NOT recommend booking one of those tours! We were highly disappointed and here’s why: You’re on one boat with around 10 to 15 people. That’s ok because booking a private boat is very expensive (if money doesn’t matter for your vacation I’d recommend doing this though, as you can spend more or less time on every island just the way you like). BUT there are like 5 boats like the one you’re on, leaving AoNang Beach at the same time. This results in about 60 to over 100 people that arrive and leave every small island at the same time like you. For us that had nothing to do with peaceful moments and we felt very stressed and like we weren’t able to appreciate what we saw. The 4 Island Tour was a major disappointment for us. Too many people on the small islands and not enough time on every island to really calm down and take a nap under the palm trees or take some good photos. Maybe take a look at private boat tours or the boat taxi. Don’t get me wrong, Poda Island and Tub Island were beautiful and I took some nice photos on Phra Nang Island but the fact that there are people everywhere flooding the beaches really took away a lot of fun. As a photographer you really get angry because there’s this BEAST of a scenery – clear blue water, green jungle, giant mountains and cliffs – and EVERYWHERE are people that disturb your perfect shots. I’m even getting mad writing this right now!! Argh! So all in all nothing we would recommend. A better option might be the taxi boats that brings you to an island of your choice for a fraction of the money a half-day tour costs but I don’t know how exactly this works and the boats only leave with at least 7 people on them, so you have to wait and hope for 6 other people showing up in the near future that want to go to the same island. May work in high season but for us, being there in low season, it would have been utopian to hope for that. Quick tip in between: did you try these iced shakes they sell around every corner here? The idea is simple: fruit, crushed ice and maybe some syrup in a blender and you get a fruit iced shake. These things are awesome and so refreshing! We loved tasting all the different flavors. …are a great way to explore your surrounding. It’s cheap and makes so much fun! The regular price is 200 THB (≈ 6 US$) for 24 hours! In low season you might get it for 150 THB and if you rent a bike from a very good hotel for example you may have to pay 250 to 300. Negotiating is always an option as there are many places where you can rent scooters. We never saw a connection between the price and the age or condition of the bike but remember that they will eventually charge you gigantic amounts of money if you scratch them. So with an older model that has it’s quirks you have the chance that they won’t notice a scratch you did. The standard procedure includes that you give them your passport as deposit and sign a contract. We never had any problems and no one tried to put us over the barrel with a contract but I definitely recommend reading them before (or pretty much everything you ever sign). A better option is to rent scooters from your accommodation if it offers that service. Most time you won’t have to give them your passport as they have your information anyway and sometimes you don’t even have to sign a contract. If this isn’t an option for you and you don’t feel very comfortable with giving away your passport you could try giving them money as deposit. We never tried this (and never had any problems with our passports) but we spoke to someone who suggested this successfully. We drove from AoNang Beach to Krabi Town. The ride itself is fun because you drive almost only on rural roads with not much traffic on them so you can pull the throttle. Remember: In Thailand you drive on the left side of the road. That might confuse you in the beginning but as Thais make up their own rules on the streets anyway, nobody will notice if you’re a little uncertain. One thing we learned about traffic in Asia: it looks like pure chaos on the streets! People drive against the stream, motorbikes use every little gap between cars to get to the front of a line and pedestrians hope for luck and just cross the streets everywhere. But Asians are used to this from the day they were born! We never saw a car accident in Asia as everybody drives slow and really pay attention to others. Often cars honked their horns when they overtook us and we thought they wanted to complain that we drove too slow. Took us a while till we realized they wanted to warn us so we don’t suddenly swing out and crash into them. Traffic in Asia is not as dangerous as it seems. Everyone pays attention to each other and they’re all used to this kind of traffic. You as someone who is used to western style traffic admittedly, should really pay attention and be careful! There are cities in Asia which even scare the best drivers so do baby steps and try driving on rural streets and small towns first! Krabi was not really a dream of a city but the Thara Park or the harbor are worth a visit and right in the center there’s a pretty good food marked where we bought a quite big bag of fruits for only around 1 or 1.50$! So if you’re bored anyway just hop on your scooter and look where the streets take you. You really don’t have to worry about using too much gas because refuel is so cheap! We payed around 2$ for a full tank and needed only a third of it in the end. All in all, renting scooters is one of the cheapest ways to get around. All in all I gotta say that we were happy to leave AoNang beach after four nights. Once you walked the promenade up and down several times there’s not much to do here. Maybe the inland has more to offer but we were more interested in beaches at this time. As a stop before going to some islands it was a nice location. But we didn’t want to stay longer actually. NIce. 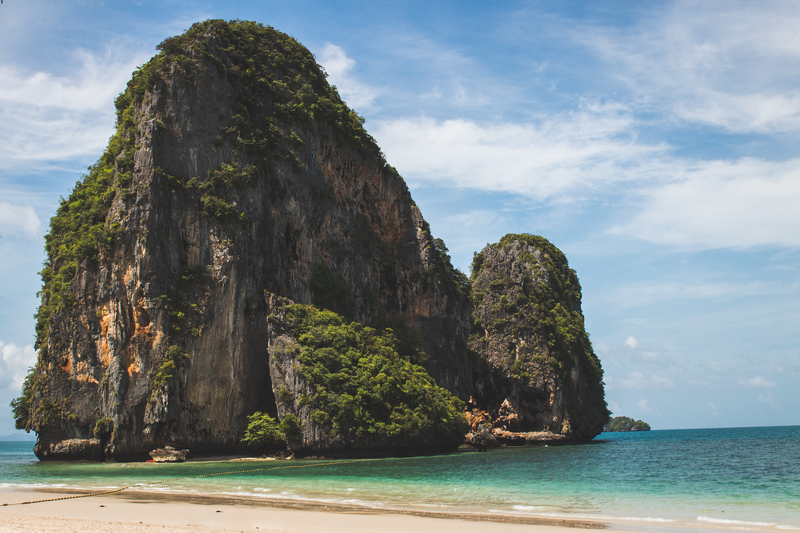 We prefer Phang Nga than Ao Nang. Both are small place but in Phang Nga it is less tourist and the food are cheap and delicious. You are welcome. Are you still in Thailand?